Carte de Visite and Tintype Photograph Album with photographs of people from Piscataquis County, Maine - Monson, Maine in particular - and places where some of the people later moved. The album measures approximately 4" by 5" by 2-1/2" and contains 44 photographs and 3 trade cards. The album features a contents page but it's not filled out. Fortunately, many of the pages of single photographs bear an identification, such as the first two below, which show photographer Daniel Carr Dinsmore and his wife Margaret E. (Gerrish) Dinsmore, "Maggie". 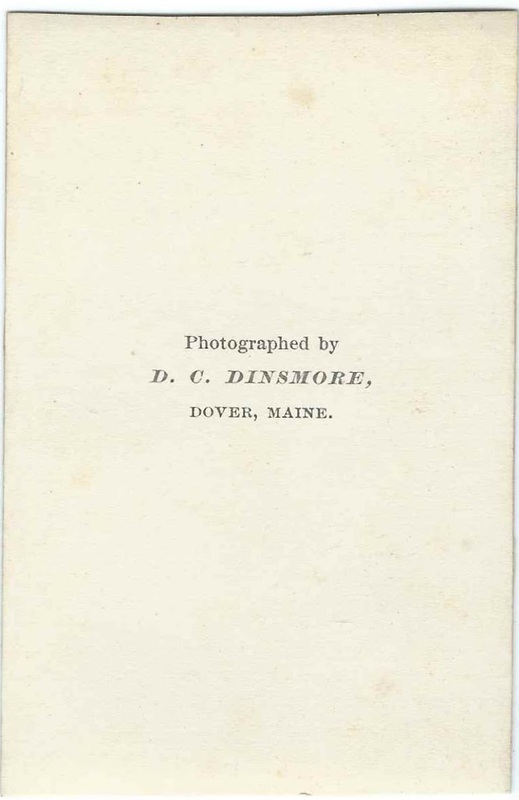 Both of the CDVs were taken at Daniel's studio, the D. C. Dinsmore studio at Dover, Maine. One of the Homer family members shown in the album was James Rudolph Homer, who was born at Monson, Maine, and who moved to Galion, Ohio, where he became mayor. The CDV and those of his children Charles and Lulia Bell were taken at the B. Cummings studio of Galion, Ohio. Identified CDVs and Tintypes in the Album - in addition, there are another 22 photographs, 19 of which are unidentified; two trade cards; and one card from The Youth Companion. If you have corrections to any of the information presented or additional information on any of the people mentioned, please leave a comment or contact me directly. "Mamie E. Davis", a toddler; CDV by the N. W. Smith studio of Monroeville, Ohio. Mamie was born about 1869 in Ohio, daughter of John Sowers Davis and Catherine (Pasco) Davis. Daniel Carr Dinsmore of Dover, Maine; probably a photograph taken by himself at his D. C. Dinsmore photograph studio at Dover, Maine. His CDV faces that of his wife Margaret E. (Gerrish) Dinsmore, "Maggie"
Margaret E. (Gerrish) Dinsmore, "Maggie", of Dover, Maine; wife of Daniel Carr Dinsmore, owner of the D. C. Dinsmore studio of Dover, Maine, which produced the CDV. Maggie's photograph faces that of her husband. "Mrs. Gerrish"; CDV by the studio of Daniel Carr Dinsmore of Dover, Maine. Mrs. Gerrish may have been Daniel C. Dinsmore's mother-in-law, Abigail (Rogers) Gerrish, wife of John Gerrish and mother of Maggie E. (Gerrish) Dinsmore. "J. Goodell". Tintype by the C. M. Duvall studio, presumably the C. M. Duvall who had several studios in Oregon and Washington. Could he have been Joseph Eugene Goodell, born in 1848 at Monson, Maine, son of Joseph Goodell and Fidelia (Stevens) Goodell, and husband of Jennie Martha Weeks? "Mr. Hart, Sumner Hart's father". Presumably Franklin Hart, born in 1829 in Piscataquis County, Maine, husband of Nancy Maria (Norris) Hart and father of Sumner Lewis Hart, who was born in 1868 at Willimantic, Maine. Tintype taken at the studio of A. G. Farrar of Bangor, Maine. His tintype faces one of his wife, Nancy Maria (Norris) Hart. "Mrs. Hart - formerly Norris". She was Nancy Maria (Norris) Hart, daughter of Josiah Norris and Almira (Cole) Norris and wife of Franklin Hart, whose tintype faces hers. Nancy, who was born in 1834 at Danbury, New Hampshire, raised her family in Piscataquis County, Maine. Tintype with no studio imprint. "Henry Hathaway". CDV with no studio imprint. Perhaps William Henry Hathaway, born about 1852 in Piscataquis County, Maine, son of Jabez Hathaway and Olive F. (Norton) Hathaway. CDV with no studio imprint. "James Homer, Mayor of Galion, Ohio". James Rudolph Homer (abt 1833-1912), born at Monson, Maine; died at Galion, Ohio. CDV by the B. Collins studio of Galion, Ohio. "Charlie - children of James Homer" [referring to Charlie's photograph and the facing one of his sister Lulia Bell Homer]; CDV of Charles Orlando Homer, "Charlie", son of James Rudolph Homer, mayor of Galion, Ohio, and a native of Monson, Maine. CDV by the B. Collins studio of Galion, Ohio. Charles was born May 13, 1858 in Ohio and died in 1907. Charlie inscribed a page in the 1880s autograph album of his cousin Wallace Homer of Monson, Maine. Lulu Homer, daughter of James Homer". CDV with no studio imprint. Lulu or Lulie was the daughter of James Rudolph Homer, a native of Monson, Maine, and Jane (Neff or Nave) Homer of Galion, Ohio, where James was mayor. "Edward Homer, son of Henry and Sarah Homer". Tintype with no studio imprint. Edward Mathews Homer was born in 1873 at Monson, Maine, son of Edward Henry Homer and Sarah Mussey (Mathews) Homer. "Mary Homer, daughter of Henry and Sarah". Mary Homer was born about 1866 at Monson, Maine, the daughter of Edward Henry Homer and Sarah Mussey (Mathews) Homer. Sadly, Mary died in 1876. Tintype with no studio imprint. "Allen Mathews"; CDV by the Wilder Brothers studio of 90 Middle Street, Portland, Maine. The name Sarah is written on the reverse. The man is presumably George Allen Mathews, "Allen", who was born at Monson, Maine, on February 4, 1845, son of Elijah Mathews and Ann (Bennett) Mathews. The CDV may have been intended for his sister Sarah Mussey (Mathews) Homer of Monson, Maine. "Jessie Mathews, daughter of Allen and Annie". Written on the reverse: "A two year old". Presumably Jessie B. Mathews, born about 1868 at Monson, Maine, daughter of George Allen Mathews and Annie Jane Morrill (Nutting) Mathews. CDV by the studio of Daniel Carr Dinsmore of Dover, Maine. "Allen Mathews and wife". The page shows George Allen Mathews; the CDV of his wife Annie Jane Morrill (Nutting) Mathews is on the facing page. George Allen Mathews was born February 4, 1845 at Monson, Maine, son of Elijah Mathews and Anna (Bennett) Mathews. CDV by the J. H. Lamson studio of 152 Middle Street, Portland, Maine. "Jessie Mathews, daughter of Allen and Annie". Jessie was born about 1868 at Monson, Maine, daughter of George Allen Mathews and Annie Jane Morrill (Nutting) Mathews. CDV by the studio of Daniel Carr Dinsmore of Dover, Maine. "Edward Mathews". Tintype with no studio imprint. Possibly Edward B. Mathews, born in 1838 at Monson, Maine, son of Elijah Mathews and Ann (Bennett) Mathews. "John Sawyer". CDV with no studio imprint. Perhaps John Emery Sawyer, born in 1854 at Elliottsville, Maine, son of John Emery Sawyer and Geraldine (Drake) Sawyer and wife of Olive Annette (Staples) Sawyer. "Johnnie D. Skilton". CDV by the N. W. Smith studio of Monroeville, Ohio. John Davis Skilton, born in 1867 in Ohio, son of Alvah Stone Skilton and Amanda Jane (Davis) Skilton. "Allen Steward, son of Abbie Mathews Steward". Sadly, the slot is empty. "And wife Ella" [completing the phrase on the facing page: "Allen Steward, son of Abbie Mathews Steward". Allen married Sarah Fretz; It's more likely that Ella was Allen's sister Ella M. Steward, who fits the time frame better than Allen's daughter Ella, who was born in the 1890s. 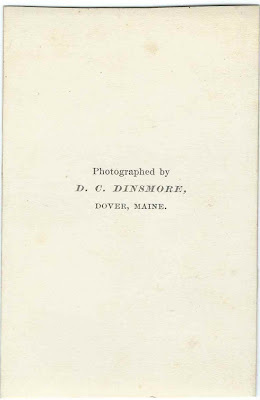 The CDV was taken at the studio of Daniel Carr Dinsmore of Dover, Maine. Ella was born about 1855, daughter of John in the daughter of John Steward and Abbie J. (Mathews) Steward. I am researching my family tree and I have knowledge of the Nutting, Dinsmore, Allen, and Davis line. I would need some time to investigate furather. These family are most likely decedent's of the Mayflower lines. Wilder last name ties in to my research as well. Interesting! As I was researching the people in the album, I could see the interconnections. Thanks for commenting. My Great Uncle Ed Ahlm married Ella Mathew Steward who was born in 1893. Her father was Allen Mathew Steward son of John and Abby J. Their other children were Ella Mathew Steward born 1855, Mercy Anne Steward Simons b 1858 and Lucis Steward born 1860 and died 1865. John Steward died in the Civil War. Abby, Allen, Ella and Mercy move to Kansas in the 1880s. I will have to tell my cousins and their Steward cousins about this page. All those names are so interesting! Glad you happened by! Not sure what you mean by notify, but there's a search box in the right margin of this blog, near the top, which will search what I've already posted, and perhaps you will find something else on your family. 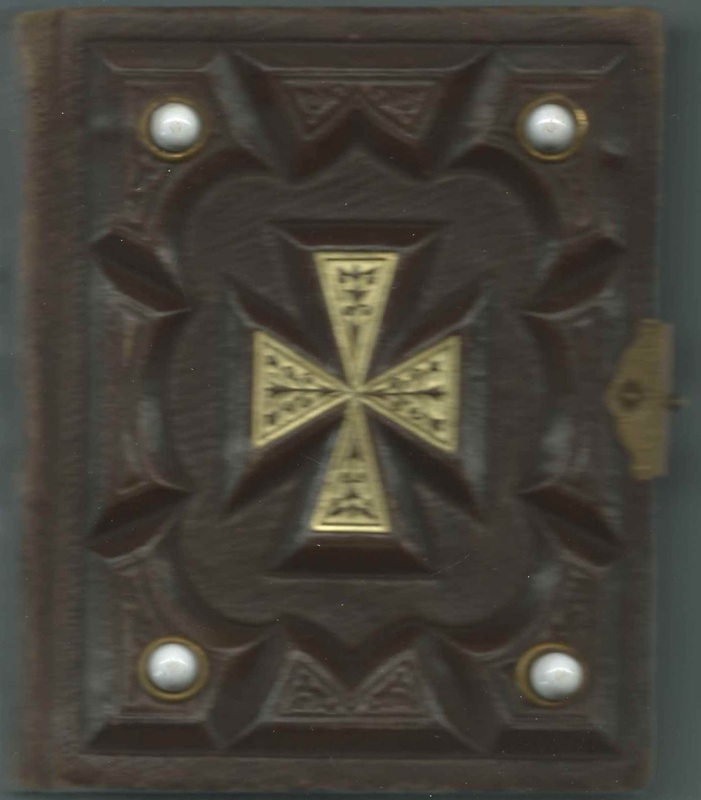 If you're asking if the photograph album is still available, yes, it is, as of 3 April 2019. You can contact me by email - see Inquiries on right margin. Sweet. I will try to respond by e-mail. Wish me luck I am new to the internet!